Kanye West has returned to Instagram, The FADER reports. 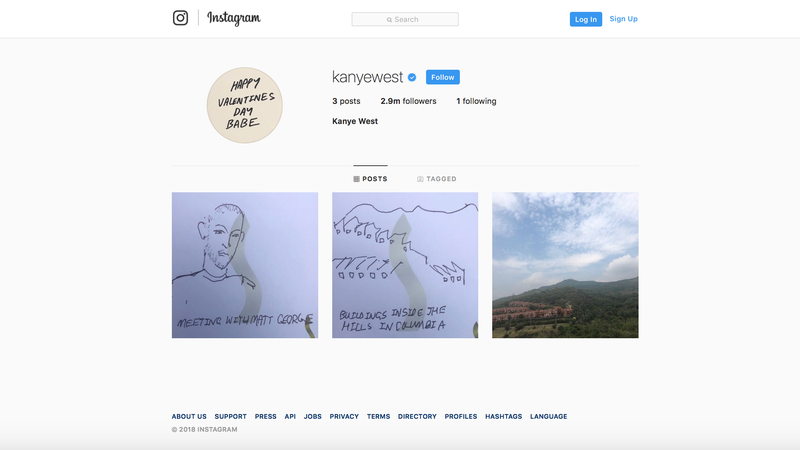 On Tuesday, he posted a series of three images, his first since deleting his official @kanyewest account in February. The first post is a photograph of a lush, green hillside with a few rows of buildings standing towards the base. The second is a drawing of those buildings and that hill, presumably by West, clarifying they are “buildings inside the hills in Columbia [presumably sic].” The third is a sketch of a man named Matt George. “Meeting with Matt George,” a line of handwriting under the image reads. Why is Kanye back on Instagram? Why did Kanye leave Instagram? Why did Kanye start using Instagram in the first place? Why does any successful rich person use Instagram for non-purely promotional purposes? Do they know they don’t have to? Or like………really good drugs we don’t know about?? Why is Kanye in Colombia? What’s Kanye doing with Matt George, whom The FADER identifies as “Canadian designer and YEEZY consultant Matt George”? Are they working on something? Are we sure that that’s “Canadian designer and YEEZY consultant Matt George”? He kinda looks like this actor-turned-writer Matt George I found on IMDB. He played Grimlock #1 on a 1999 episode of Charmed. It could be him. You never know.